Hotels are hotspots for traffic of all kinds. With travelers coming in and out all the time, a myriad of things get brought in and left behind frequently. Sometimes, those “things” are bed bugs. These tiny, parasitic arachnids make their homes wherever humans are found. Only several millimeters in length and width, they can be difficult to spot with the naked eye and equally as difficult to exterminate without the proper equipment. For these reasons, hotel cleaning staff often fail to indentify or treat bed bug infestations when they occur in hotel rooms. The responsibility thus falls to you, humble traveler, to check for bed bugs in any hotel, motel, or rental you may stay at during your travels. Failure to do so can result in bed bug bites, lost sleep, and unwanted bed bug hitchhikers coming home with you at the end of your trip. In this guide, our professionals here at EcoClear Products will show you how to perform a thorough check of your hotel to find any bed bugs that may be lurking in your sheets, carpeting, or elsewhere. We’ll also give you information on our very own Stop Bugging Me!™ for Bed Bugs product line to help you control and prevent bed bug infestations wherever you go. Read on to learn more, and shop bed bug solutions with our team at EcoClear Products today! Before beginning a bed bug inspection in your hotel room, the first thing you should do is protect any possessions you’re going to be bringing into the room. Protecting your possessions will ensure that no bed bugs find their way into any luggage or clothing, which will save you a lot of hassle in the long run. (Believe us: the only thing worse than encountering an infestation on the road is bringing one home with you.) While you can’t leave your bags and other items outside your hotel room for long periods of time, what you can do is put them in the bathtub or on the shower floor. The cool, exposed tile is a natural bed bug deterrent, and you can be sure that even if there are bed bugs in your hotel room, they won’t have made their homes in your shower. We also recommend preemptively spraying your belongings with an anti-bed bug travel spray like Stop Bugging Me!™ for Bed Bugs (available in TSA-approved travel sizes). So, now that you’ve safeguarded your belongings, there’s only one thing left to do before checking for bed bugs in your hotel room. A proper bed bug inspection requires a few essential supplies. Gathering these supplies before beginning your inspection will greatly increase your chances of finding bed bugs during your search. First, you’ll want to get your hands on a flashlight. Bed bugs love to hide in dark, cool areas that can sometimes be difficult to peer into, even with overhead lighting. A flashlight will help you get the best view possible of this prime bed bug real estate. 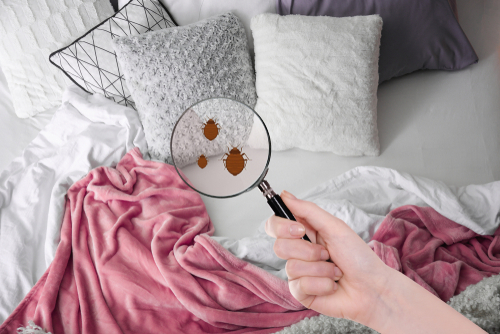 Grabbing a magnifying glass will also help you spot bed bugs during your search. We also highly recommend printing out the EPA’s wallet-sized bed bug ID printout to help you identify signs of bed bugs and their eggs during your inspection. Grab tweezers and a small baggie to pick up any bugs you do find. You can take them to a vet or pest control professional in your area for identification after your inspection. After grabbing the proper supplies, it’s time to begin your inspection. You’re looking for bed bugs, obviously—but what do bed bugs look like? Bed bugs are small, oval-shaped arachnids no larger than 3 – 5 millimeters in length or width. They are reddish-brown in color and have vestigial wings that cannot be used for flight. Bed bugs eggs are translucent in color and about the size of a poppy seed. When crushed, bed bugs leave behind reddish-brown stains. Bed bugs are ectoparasites that feed exclusively on human blood. They are found wherever their human hosts are easily accessible. Areas like beds, couches, clothes—places us humans frequently inhabit for long periods of time—are prime bed bug habitat. In your hotel room, start your search at the bed. Remove all comforters, blankets, and sheets, taking care to check each layer for signs of bed bugs. Pay special attention to corners and seams—these provide bed bugs extra shelter and are thus more likely to harbor them. Once you get to your mattress pad, you’ll want to remove in and check both sides for bed bugs. Take a good look at your mattress too—especially in the textured areas and deep seams. You’ll also want to check your box spring, bed frame, and headboard. Moving past the bed, you’ll want to inspect areas with high human usage and ideal bed bug hiding spots. These include most furniture items and areas where clothing is stored. Check all surfaces of chairs and sofas, and leave no drawer unopened. If your hotel has carpeting, you’ll want to give that a once-over too. Should you find bed bugs or signs of bed bugs in your room, the first thing you’ll want to do is document your findings and let the hotel know. Take pictures, leave markers, and notify the front desk. Most hotels will gladly find you another room or negotiate and refund agreement should you decide to switch hotels. To be safe, you’ll also want to check your luggage and clothing for any signs of bed bugs before making more travel arrangements. If you’re worried that bed bugs may have their way onto your belongings, ask the hotel to use their dryer. Putting luggage and clothing in any dryer on “normal” or “high” settings will expose bed bugs to temperatures high enough to kill them. You can also spray your belongings with our eco-friendly and highly-effective Stop Bugging Me!™ for Bed Bugs travel spray. Learn more about the many advantages of this high-performing product below. Here at EcoClear Products, our green-minded engineers have developed an environmentally-friendly, extra-effective product to help users take care of bed bugs at home or on the go. Stop Bugging Me!™ for Bed Bugs travel spray uses all-natural ingredients to provide broad-spectrum control and prevention against bed bugs. Simply spray it on your belongings to exterminate existing bed bugs and ward off new ones for weeks. The best part? This travel spray is safe to use around children, pets, and wildlife. You can also check out our Stop Bugging Me™ Laundry Additive for extra bed bug control from your home washer. Explore the links above to learn more, and shop with us today!